Freescale Semiconductor, Inc. was an American multinational corporation headquartered in Austin, Texas with design, research and development, manufacturing and sales operations in more than 75 locations in 19 countries. The company employed 17,000 people worldwide. On December 7, 2015, NXP Semiconductors completed its merger with Freescale for about $11.8 billion in cash and stock. Freescale shareholders received $6.25 billion in cash and 0.3521 of an NXP share for each Freescale common share. Including the assumption of Freescale’s debt, the purchase price is about $16.7 billion. Freescale was one of the first semiconductor companies in the world, having started as a division of Motorola in Phoenix, Arizona in 1948 and then becoming autonomous by the divestiture of the Semiconductor Products Sector of Motorola in 2004. In 1955, a Motorola transistor for car radios was the world’s first commercial high-power transistor. It was also Motorola’s first mass-produced semiconductor device. In the 1960s, one of the U.S. space program's goals was to land a man on the moon and return him safely to Earth. In 1968, NASA began manned Apollo flights that led to the first lunar landing in July 1969. The Apollo program was particularly significant for hundreds of employees involved in designing, testing and producing its electronics. A division of Motorola, which became Freescale Semiconductor, supplied thousands of semiconductor devices, ground-based tracking and checkout equipment, and 12 on-board tracking and communications units. An "up-data link" in the Apollo's command module received signals from Earth to relay to other on-board systems. A transponder received and transmitted voice and television signals and scientific data. Also that year, Motorola’s technologies were used to introduce the first two-way mobile radio with a fully transistorized power supply and receiver for cars. Motorola has continued its growth in the networking and communications sector in later years, providing the tools behind the radio transponder that delivered the first words from the moon in 1969, and going on to develop the first prototype of the first analog mobile phone in 1973. The company’s first microprocessor (MC6800 8-bit) was introduced in 1974, and was used in automotive, computing and video game applications. Motorola’s next generation 32-bit microprocessor, the MC68000, led the wave of technologies that spurred the computing revolution in 1984, powering devices from companies such as Apple, Commodore, Atari, Sun, and Hewlett-Packard. In the 1990s, Motorola’s technology was the driving force behind intelligent power switches for anti-lock brake systems, one of the first microelectromechanical systems (MEMS) inertial sensor for automotive airbags, and Motorola’s MPC5200 microprocessor deployed telematic systems for General Motors’ OnStar systems. Since then, Freescale continued to provide the technology behind consumer, medical, networking and automotive products from microprocessors for the world’s first tubing-free wireless insulin pump, to and automotive microcontrollers for efficient engine design. Freescale’s motion-sensing accelerometer powers the interactivity of the Guitar Hero video games. The number one provider of eReader processors worldwide was Freescale. In 2009, Freescale demonstrated the world's lowest startup voltage single inductor DC/DC converter for use in solar and thermoelectric energy harvesting applications. In 2011, the company launched the industry’s first multimode wireless base station processor family that scales from small to large cells – integrating DSP and communications processor technologies to realize a true "base station-on-chip". In addition, a recent ABI Research market study report states that Freescale owns 60% share of the radio frequency (RF) semiconductor device market. Also in 2011, Freescale announced the company's first magnetometer for location tracking in smart mobile devices. With the partnership of McLaren Electronic Systems, they helped the NASCAR Sprint Cup Series vehicles convert from carburetors to fuel injection starting in 2012. On March 8, 2014, Freescale announced that 20 of its employees were passengers aboard Malaysia Airlines Flight 370. That plane, carrying the Freescale employees, was lost, with only small part of it found over a year later. In March 2015, a merger agreement was announced through which Freescale Semiconductor would be acquired by NXP Semiconductors and that the companies would be merged to form a US$40 billion company. The acquisition closed on December 7, 2015. On February 26, 2013, Freescale Semiconductor announced the creation of the world’s physically smallest ARM-powered chip. The Kinetis KL02 measures 1.9 by 2 millimeters and is a full microcontroller unit (MCU), meaning the chip sports a processor, RAM, ROM, clock and I/O control unit. The chip competes with the Atmel M0+ offerings, which are the low-power leaders in the industry. One application that Freescale says the chips could be used for is swallowable computers. Freescale already works with a variety of health and wellness customers. Both the Fitbit and OmniPod insulin pump use Freescale chips. The new chip was on display at 'Embedded World' in Nuernberg, Germany, from February 26–28, 2013. Up to now devices with leading letter codes L, E, M, W containing ARM Cortex-M0+ cores and letter code K or KW containing ARM Cortex-M4 cores are known (see also the related section in the List of Freescale products). In August 2014, Freescale Semiconductor introduced a range of fully programmable wireless charging chip and reference designs for consumer and automotive applications. The new chipset is certified to work with both the Wireless Power Consortium's Qi wireless standard and the Power Matters Alliances charging specifications. Freescale focused primarily on automotive applications and is second in market share in automotive applications to Renesas Electronics. Due to this focus and exposure it is expected that car-sharing applications like Zipcar will have a significant negative impact on future Freescale revenues. Motorola announced that their semiconductor division would be divested on October 6, 2003 to create Freescale. Freescale completed its IPO on July 16, 2004. 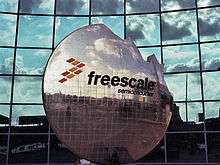 On September 15, 2006, Freescale agreed to a $17.6 billion buyout by a consortium led by Blackstone Group and its co-investors, Carlyle Group, TPG Capital, and Permira. The buyout offer was accepted on November 13, 2006 following a vote by company shareholders. The purchase, which closed on December 1, 2006, was the largest private buyout of a technology company until the Dell buyout of 2013 and is one of the ten largest buyouts of all time. Freescale filed to go public on February 11, 2011 and completed its IPO on May 26, 2011. Freescale is traded on the New York Stock Exchange under the ticker symbol FSL. At the time of the IPO, the company had $7.6 billion in outstanding debt on its books, and the company is being investigated for misconduct related to this IPO. Freescale is being sued by Marvell Semiconductor for infringing seven patents held by Marvell. The case is being litigated in the US District Court for the West District of Texas. Freescale recently lost a patent infringement lawsuit filed by Tessera Corporation and was forced to pay an undisclosed amount as part of the settlement. Freescale competes with a host of other silicon vendors, including Marvell Semiconductor, Qualcomm, Texas Instruments, Intel, AMD, Toshiba, ST Microelectronics, Infineon, NEC Corporation, Nvidia, Microchip Technology, Renesas, VIA Technologies, and Samsung Electronics. Clock driver software written by Freescale was responsible for the 2008 Zune leap year bug. ↑ "2013 Form 10-K, Freescale Semiconductor". U.S. Securities and Exchange Commission. ↑ NXP Semiconductors And Freescale Semiconductor Close Merger RTTNews. Retrieved on 2015-12-13. ↑ Freescale Connected Intelligence. Freescale.com. Retrieved on 2013-12-08. ↑ Motorola on the Moon Archived January 4, 2012, at the Wayback Machine. ↑ "Insulin Pumps - Insulin Pump Therapy - OmniPod Insulin Management System". Retrieved July 21, 2015. ↑ "Freescale Semiconductor harvests energy from each solar cell". ↑ Team Register (March 9, 2014). "20 Freescale staff on vanished Malaysia Airlines flight MH370". The Register. Retrieved August 28, 2016. ↑ Maly, Tim (2013-02-26). "Freescale's Insanely Tiny ARM Chip Will Put the Internet of Things Inside Your Body". Wired.com. Retrieved 2013-12-08. ↑ By Lucas Mearian, ComputerWorld. “Freescale introduces multi-standard, programmable wireless charging chips.” August 27, 2014. September 18, 2014. ↑ "Large Buyout" (Press release). ↑ "Freescale Debt" (Press release). ↑ Freescale Investigation "Holzer Holzer & Fistel, LLC Announces Investigation into Freescale Semiconductor Holdings I, LTD" (Press release). Reuters. October 5, 2011. Retrieved March 16, 2012. ↑ Marvell Semiconductor, Inc. et. al. v. Freescale Semiconductor, Inc. patent lawsuit. News.priorsmart.com. Retrieved on 2013-12-08. ↑ Tessera Technologies, Inc. (TSRA): Tessera Technologies and Freescale Semiconductor settle. Seeking Alpha (2013-08-19). Retrieved on 2013-12-08. ↑ "Yahoo Finance - competitors of FSL". ↑ Why The Zune Croaked, Exactly (MSFT) - Business Insider. Articles.businessinsider.com (2009-01-02). Retrieved on 2013-12-08. ↑ Cause of ZUNE leapyear problem – Freescale date routine | MAKE. Blog.makezine.com. Retrieved on 2013-12-08.